Today, millions of Americans suffer day in and day out from chronic pain that’s located in the neck, face, and jaw. A great deal of this discomfort comes from Temporomandibular Joint Disorder, or TMD. 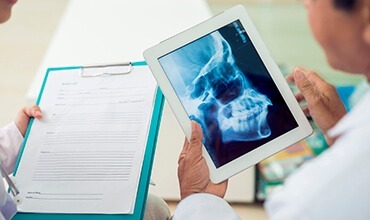 Your temporomandibular joints have the crucial job of connecting the mandible to the skull, and they also facilitate the necessary movements as you eat, speak, yawn, and smile. This constant use can result in damaging and outright debilitating consequences for your quality of life. Thankfully, Dr. Ronan Freyne can help with focused TMJ therapy here in Chevy Chase. Please don’t hesitate to contact us if you’re ready to pursue the high-quality, trustworthy care you deserve! If you suspect that you may be suffering from TMD, let Dr. Freyne know right away. He will start by carefully inspecting your jaw joints and bite and forming a diagnosis. Once our team better understands the severity of your condition and the potential causes behind it, we can formulate an effective treatment plan. 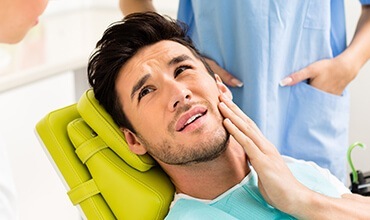 For instance, if a misaligned bite is the likely culprit behind chronic TMJ pain, occlusal (bite) adjustment may be capable of restoring harmony to your smile. Alternatively, a custom-made occlusal splint can be worn to cushion the teeth and prevent bruxism or tooth grinding (another likely cause of TMJ disorder) while also providing a much more comfortable resting position for your jaw.